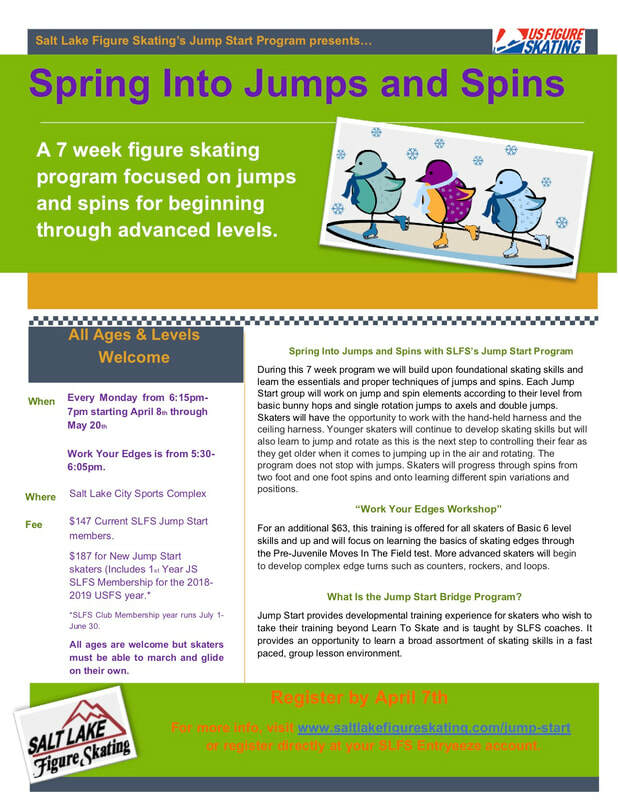 Salt Lake Figure Skating has been offering the Jump Start bridge program since the Fall of 2014. Its purpose is to provide developmental training experience for skaters who wish to take their training beyond Basic Skills. Jump Start is taught by SLFS coaches and designed to provide an opportunity to learn a broad assortment of skating skills in a fast paced, group lesson environment. In addition to jumps, spins, turns, and edges, skaters will be provided with an introduction to Moves In The Field, power, artistry, freestyle etiquette, and good practice habits. The goal of Jump Start is to provide a method of instruction before starting private lessons with a coach, to begin to prepare students for their first US Figure Skating assessments (Pre-preliminary or Adult Pre-Bronze), and/or as a first step towards ​Basic Skills competitions. In conjunction with Jump Start, we also offer the "Work Your Edges" workshop for skaters at USFS Learn to Skate Basic 6 and above for an additional fee. The focus is learning the basic skating edges up to an including the Pre-Juvenile Moves In The Field test. Enrollment in Jump Start and "Work Your Edges Workshop" requires membership with Salt Lake Figure Skating. We have several membership levels to meet each skater's needs from Introductory Jump Start, Second Year Jump Start, Full Member, Adult, and Associate member. See our Membership page for details and costs. SLFS/USFS benefits include: coverage under US Figure Skating’s sports accident insurance policy, a year-long subscription to SKATING magazine, the ability to test and compete in USFS events, ability to participate in SLFS’s Club Ice, IceStravaganza Ice Show, and special events, permission to buy a SLFS club jacket, and much more. Groups are arranged by age and ability level and skills taught will be tailored to the needs of each group. Sessions are appropriate for all ages (kids through adults) and everyone is welcome. Skaters must be able to stand and march on one's own at a minimum. Participants will have access to the Club Ice freestyle session just before class on Mondays from 5:30pm until 6:15pm to use as warm up or extra practice ice. Below are detailed instructions on how to self-register for Jump Start and Work Your Edges Workshop through the EntryEeze website. ​If you have any issues or questions, contact us at jumpstart@saltlakefigureskating.com. We're happy to help! Select the “Introductory Jump Start 1st Year Membership" (select the under 18 membership if your skater is under 18 years of age). Click “Apply”. NOTE: You must add a “Jump Start Guardian” membership to your cart if your Jump Start skater(s) is under 18 years old. There is no cost associated with the “Jump Start Guardian” membership. Add the parent as a “New Family Member, click “Apply/Renew, Select the parent’s name and the “Jump Start Guardian Membership”. Click the “Existing Members Access My Account” tab on left side. Log into your account. Select the “Jump Start 2nd Year Membership" (select the under 18 membership if your skater is under 18 years of age). Click “Apply”. Select the “Associate” Membership Click “Apply”. ​​Please make sure to arrive by 6:00 pm each week so that you have plenty of time to tie and/or rent skates and get to the ice. The cost of Rental Skates is not included in your Jump Start registration. If you need to rent skates, please make sure to leave plenty of time to do so. We will start promptly at 6:15 pm and you will want to be on time to get the most out of the Jump Start session. If your skater wears a helmet for other skating sessions, please make sure that you bring it to use at each Jump Start session. It is cold on the ice, please make sure that your skater has the appropriate cold weather gear including gloves or mittens. PLEASE encourage all skaters to stop by the restroom BEFORE class starts so that your skater can stay on the ice and get the most out of the whole session. Skates can be rented at the skate rental window – if you need assistance with skate rental and no one is at the rental desk – PLEASE ASK THE FRONT DESK FOR ASSISTANCE. Jump Start will be held on the East Rink – it is the 2nd rink in the back of the facility. Once your skater gets onto the ice, they will be separated into groups by ability. If your skater has participated in the past, we have a good idea of what group they will start in this session. SKATERS NEW TO THE JUMP START PROGRAM should check in with a coach as soon as they get onto the ice. Members of the Salt Lake Figure Skating Club and some of the coaching staff will be on hand at 6:00 pm on Monday to welcome you to the new session and to answer any questions. Sessions begin at 6:15 pm with warm-up and stroking. If you arrive late, please have your skater join us on the ice as soon as possible. If you need assistance getting your skater onto the ice, please come find one of us right away!